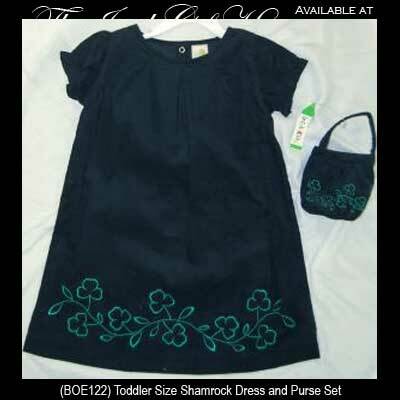 This Irish baby dress features embroidered green shamrocks along the bottom edge of both sides and is enhanced with elastic sleeves. The dark navy blue toddler size Irish dress is made of 100% cotton and has green button snaps on the back. A matching embroidered shamrock purse is included and it is received with a shamrock history card, complements of The Irish Gift House.